I'll start as I intend to go on with this entry; radiating sunbeams of positivity that will warm your heart and carry you through the day. In that spirit I'd like to let you all know that Taylor and Francis/CRC Press have resumed their site-wide sale - that sees my book Independent Animation: Developing, Producing and Distributing Your Animated Films available at 20% off - through to the end of year. Plus you save even more if you grab it up with another CRC book - or why not just buy multiple copies of mine and stuff them in the stockings of your nearests and dearests this holiday season? You'll have to really ram them in there though, they're quite bulky. 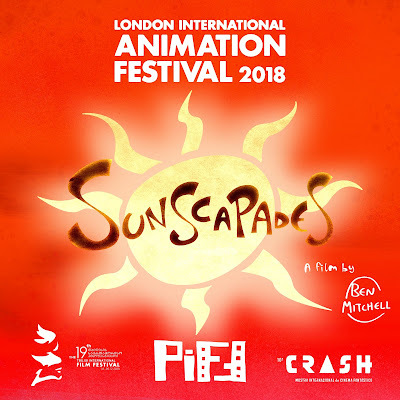 It's a busy end of the year for Sunscapades, and I'm excited to be headed down to the London International Animation Festival this Saturday for its inclusion in the Late Night Bizarre programme (9pm at the Horse Hospital - be sure to come or all those horse ghosts will never find peace). On December 13th the film returns to Brazil for the CRASH (formerly TRASH) International Fantastic Film Festival. This will be part of the 3pm International Shorts 1 screening at the Cine Cultura in Goiânia. Kicking off shortly after that will be Romania's Ploiesti International Film Festival, an event that had the damn fine taste to screen Klementhro back in 2016. Reassuringly Sunscapades has also passed muster and will be playing in the festival's Dark Comedy section. It will also be presented in Georgia at the Tbilisi International Film Festival 6pm tonight at the Cinema House as part of a special Best Of British Animation screening curated by the Anilab/Encounters Festival team and introduced by my pal Laura Tof. Speaking of UK Animation, as previously mentioned the BBC4 documentary Secrets of British Animation screened last night to much enthusiasm and will be available on the BBC iPlayer for the next month or so if you didn't catch it. Personal highlights include a wonderful segment on Joanna Quinn and a behind-the-scenes look at my 2017 summer fling Chuck Steel: Night of the Trampires. At only an hour it could never have been a fully comprehensive overview of all of British animation's best and brightest, but the laundry list of conspicuous absences make a pretty good case for a follow-up doc or maybe something more like a series down the line. Fingers crossed someone over at the BBC feels the same way. At any rate be sure to get it watched while you can and massive kudos to director Seb Barfield, producer Sophie Taylor and the rest of the Academy 7 team for a fantastic job.